Ψ Gravitational Contraction - the implosion of a star or other celestial body under the influence of its own gravity, resulting in a body that is many times smaller and denser than the original body; the process by which stars, star clusters, and galaxies form from interstellar gas under the influence of gravity. The birth place of the stars is a very dense region of molecular clouds and gas, the remnants of dead or dying stars. It will take 100,000 or so years but within that span of time the central region of the stellar cloud will begin to see an increase in tempature, beginning around 100 Kelvin (-279.67 fahrenheit), eventually rising to about 4,500 Kelvin (7640.33 fahrenheit). This heat is due to the accelerated gravitional pull of the gas and dust towards a central region of the cloud, a process known as accretion. The dust and gas, continuing to collect and mass within the molecular cloud will eventually fragment as it collapses, each fragment forming a protostar. The heating of the star forming region is a result of the conversion of gravitational energy to thermal kinetic energy and not as a result of thermonuclear reactions (see a description of thremal & kinetic engery HERE). The central region of the protostar will continue to shrink in size, the atoms moving faster and faster towards the center, causing the tempeture to rise and the protostar region to begin glowing faintly with it's own light. This process will continue over the next million years, the tempeture of the protostar rising to around 5500 kelvin and leveling off there. Within this period the protostar's core tempeture will eventually reach 10 million kelvin (17,999,540.33 fahrenheit), it's size now fixed. The Protostar explodes into life, it's core so hot that hydrogen atoms are fused together releasing light, heat, helium and neutrinos, all products of the star's own thermonuclear engine. From this point on the star will begin to consume it's own resources, eventually beginning a long decline towards death when, shedding or exploding it's own mass into the universe, the star will once again become a molecular cloud of gas and particles, ready to give new life. Located at the edge of the Gum Nebula and stretching out into space for a mere 3 trillion miles is the star jet HH-47. 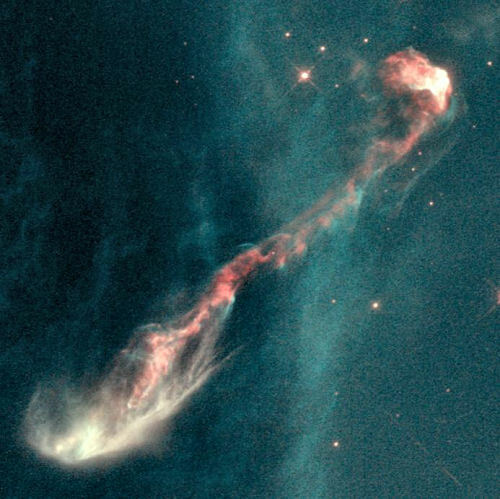 The jet, like that in the first image, is another by-product of a new star only taking a different shape and form. Located at the lower left side of this image is the star, hidden from view within the dense cloud. Above is the star-forming region called R Corona Australis. 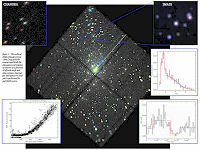 It's significance lies in the fact that "The detection of X-rays from the cold stellar precursor surprised astronomers. The observations reveal that matter is falling toward the core 10 times faster than gravity could account for." (see Space.com). Seen in the image are reddish protostars and young bright white stars. Credit: UH88 / Nedachi et al. This is a slightly wider view of the R Corona Australis star-forming region, this time seen in X-ray energies captured by ESA's XMM-Newton observatory. The six blue sources are protostars, mostly corresponding to the reddish dots seen in the image above. Credit: ESA/XMM/Subaru/UH88, Link to both above images. Seen above is the Star forming region NGC346 in the Small Magellanic Cloud (SMC). This is a multi-wavelength false-color picture created by combining X-ray (blue), infrared (red) and visible light (green). From the ESA's XMM-Newton X-ray observatory. 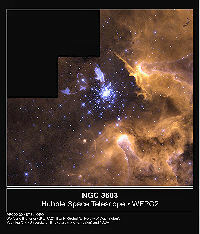 NGC 346 a .pdf file regarding evidence of sequential star formation by E. Sabbi et.al. NGC 3603: From Beginning To End A beautiful Hubble Space Telescope image From the Astronomy Picture of the Day website regarding star formation in NGC 3603. 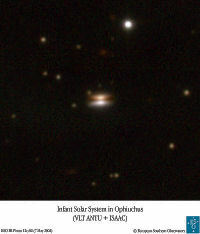 The Rho Ophiuchi cloud ESO Press Release of 09/02 - Infrared Images of an Infant Solar System. Protostars & the Orion Nebula a .pdf document regarding "X-RAY PROPERTIES OF PROTOSTARS IN THE ORION NEBULA CLUSTER: PRELIMINARY RESULTS". 30 DORADUS ACIS OBSERVATION at ANCHORS (An Archive of Chandra Observations of Regions of Star Formation). This site page is a prototype under development; the resulting catalog is "designed to aid both the X-ray astronomer with a desire to compare X-ray datasets and the star formation astronomer wishing to compare stars across the spectrum." Also see: NASA Technical Reports Server (NTRS) "a valuable resource for students, educators, researchers, and the public for access to NASA's current and historical technical literature since it was first released in 1994." Educational website from the University of Utah. 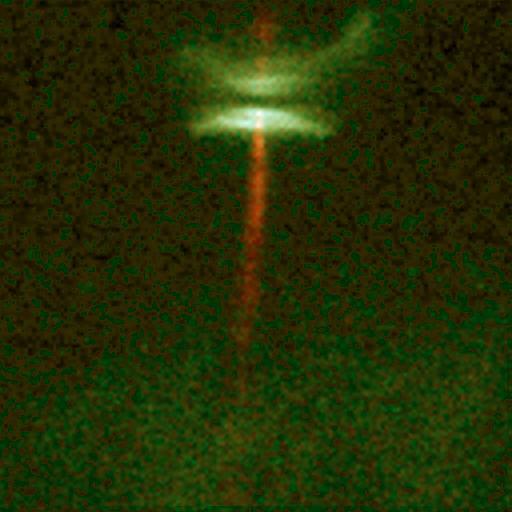 Features a nice overview of protostars and includes various animations. "Over the past 7 years, I have been performing the world's most complex computer simulations of star formation..." writes Matthew R. Bate Professor of Theoretical Astrophysics from the University of Exeter. Here you can find the models for star formation under varying parameters. Note that the animations are very large. Offering information and activity books. Imagine the Universe! is a service of the High Energy Astrophysics Science Archive Research Center (HEASARC), Dr. Alan Smale (Director), within the Astrophysics Science Division (ASD) at NASA's Goddard Space Flight Center. A very young protostar, still deeply embedded in its dust cloud.